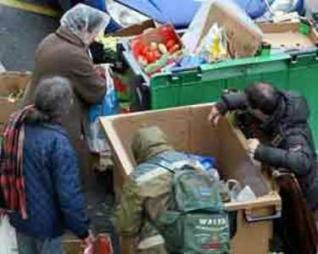 The poor in France also dumpster dive. PARIS, FRANCE. My previous dispatch may give a too idealistic image of life in France. There are major and minor problems. Yes, like the United States, France has homeless individuals and families. They cannot afford available housing and may have trouble paying for food or even finding a school for their children because they don’t have an address. Those that do have a lodging may have to spend too much on rent and may still have problems feeding their families because of low incomes. These are people who fall through the cracks of the system I have described. There are private associations that come to their aid. They operate on private donations and some government subsidies. There are even laws which are supposed to help them but are not applied. The most well-known of these associations was established by a popular actor and stand-up comic, Coluche. It is Les Resaurants du Coeur (the restaurants of the heart) established in the 1980‘s and receives more people each year. Coluche, who died in a motorcycle accident, thought that his initiative would only have to be temporary but more than 20 years later it still exists. The Restaurants serve meals, but now have food warehouses which are supplied by donations and the poorest can go there to get food staples. There are also Le Secour Populaire (assistance to the poor) and Le Samu Social (assistance to the homeless) and several other economic aid associations. (Note: Samu is the acronym for emergency medical aid.) Earlier I said that even Sarkozy was hesitant to directly attack the French social benefits system, but an exception is that his new budget has reduced by 30% its aid to the Samu Social. A law decrees that municipalities must build 20% of low-rent social housing in its total housing market. However, many of them prefer to pay a financial penalty to the government than build the housing. That is the case of the town of Neuilly next to Paris which is one of the richest in France, and coincidentally used to have president Sarkozy as mayor. It seems that the rich don’t want to frequent the hoi polloi. The richest arrondissements – sections- of Paris also oppose public housing in their jurisdiction. As one might imagine, such housing could cause problems of youth gangs and problems of security. But they are minimal. Generally, France has a policy of a mixing populations, with more or less success. The idea is to prevent ghettos. France has a policy against what is called «communitarianism» where people of the same origins are found in neighborhoods isolated from the rest of the population. It doesn’t always work, but they try. After World War II, there was a large lack of housing and the government launched a massive program of eliminating slums and building modern–for the time–housing. It created what are known as the «new cities». For a long time that worked, but gradually they became more and more populated by the poor. It turns out that it was an honest mistake because they didn’t include all the commerces and services that are needed in a real city. So they were essentially residential and the inhabitants had to travel far to go to work and even do their shopping. For a few years now, different governments have followed a policy of demolishing large apartment high-rises and rebuilding on a smaller more human level. Public housing in Paris was generally built at the outer edges of the city. Now Paris tries to build more in all parts. I live in a neighborhood that used to be working class where there were manufacturing enterprises. Gradually these moved out to areas where costs were less. Now my neighborhood has become mostly petit-bourgeois, or yuppy if you like, and thus has become much more expensive. Still, next to my place, the city built a large housing complex on empty land with a percentage of public housing. There is a park a few dozen yards from my apartment, and petty criminals tend to frequent the edges during the night to engage in different traffics, essentially drugs, but there is little violence. The police pretty well know who is who. From time to time the police make a raid to keep things under control. People who are not related to this milieu don’t run much risk. There is one funny story that happened a couple of years ago. A gang from another area came to fight with their rival dealers “native” to my neighborhood and arrived in two cars with several people. Unfortunately for them, they came during a night that the police were controling the usual suspects, blocked the road, and the new arrivals were quickly arrested. A friend of mine is a plain clothes policeman who regularly watches the area and undoubtly has his informers. The youth gang there has often seen me in his company having a drink in a nearby bar or simply walking around. They may well think that I am in the police too. At one time, individuals offered to sell me drugs or ask if I had any to sell. That doesn’t happen anymore. I know a few of them and talk to them or have a drink together, and the others tend to avoid me. A short vignette of another Paris. I feel it’s very sad what’s happening to the people of this world, but to put “socialist” in the heading isn’t what’s happening. It’s called “coup government”, witch we also have in the U.S. if you take a look at Canada where I go quite often because my girl friend lives there they are doing better than most in the world today with a socialist government. We must look closely what’s going on, people that feel poverty in the world are not the ones causing it, the people that are to blame are getting fat at the expense of the people, they go home to fancy cars, big houses and very big bank accounts. There could be a dictator running a country and if he really loved the people everybody would be happy. When a country adopts programs and policies advocated by socialists, that does NOT mean the country is suddenly “socialist”. France is a capitalist country. Many have miantained that the USSR was also a capitalist country, because despite the sweeping adoption of programs inspired by socialist thinking, the key ingredient of socialism was missing: the working class was NOT in control of anything and there was nothing looking at all like a working class majority democratic rule.